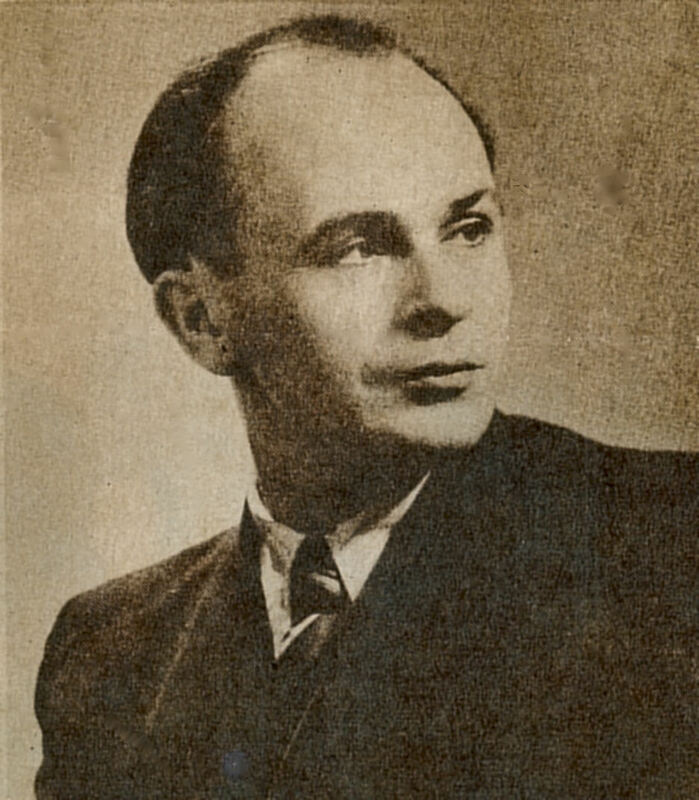 Obituary in The Forward, 9 May 1954: "THE LATE SHMERKA KACZERGINSKI," noted Yiddish poet and wartime guerilla fighter, - A hero of the Vilna Ghetto, Kaczerginski was 46 years old when he died in an air disaster in Argentina last April 27. 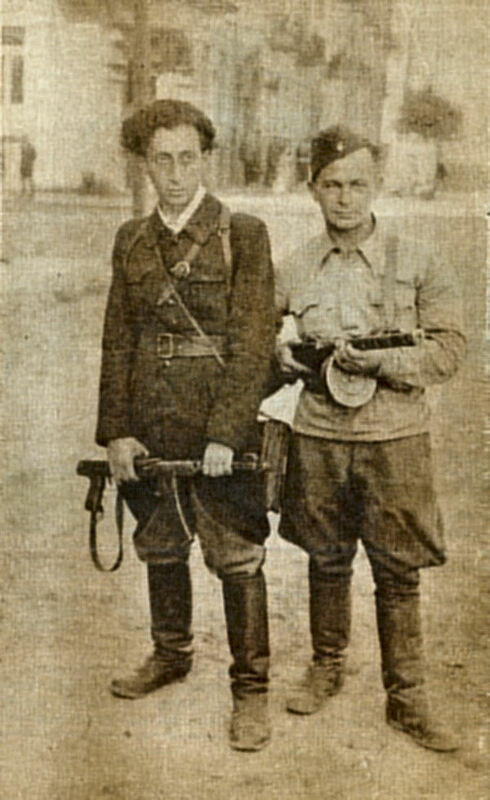 "Surviving Nazi Terror Meets Tragic Death"
Szmerka (pronounced Shmerka) Katsherginski, well-known Yiddish writer (shown in the above photo on right) as he appeared as a partisan in Lithuania during World War II, who was killed in a recent plane crash in Argentina. Pictured with Katsherginski is Abba Kovner, commander of an underground outfit which harassed the Nazis in wartime Lithuania. --from The Forward, Art Section, 9 May 1954.
er hot ibergelebt di nazi groyln un iz umgekumen in an eksident. --- Shmerke Katsherginski, der bavuster poet un kultur-tuer, a partizaner-held fun der vilner geto, velkher iz geharget gevorn in an eroplan-krakh in argentine farachtogen dinstik (dem 27stn april). Katsherginski iz alt gevorn 46 yor. er hot zikh gemakht a nomen in der yidisher literatur als eyner fun der shrayber-grupe "yung vilne", vos iz oyfgekumen mit 25 yor tsurik. Beys der milkhome, ven er hot zikh gefunen in vilne, iz Katsherginski gevorn a partizan un hot gekemft in di litvishe velder kegn hitler's makhbolim. He survived the Nazi horrors and perished in an accident. --- Shmerke Katsherginski, the well-known poet and culture activist, a hero partisan from the Vilna ghetto, who was killed in an airplane crash in Argentina a week ago Tuesday (April 27th). Katsherginski was 46 years old. He made his name in the Yiddish literature as one member of the writer's group "Yung Vilne," which came into existence 25 years ago. During the war, when he found himself in Vilna, Katsherginski became a partisan and fought in the Lithuanian forests against Hitler's forces.